All year, I’ve been working hard out to increase my level of activity and reduce my waistline. I blogged about it in June – HERE. As I said in June, my weight slowly crept up and my fitness declined since I started doing roller derby. So the start of this year I hit the gym hard and discovered the joys (and pain) of RPM. Since then (I waited for the weather to warm up!) I’ve thrown running back into the mix too. I’ve loved running ever since I first started, now over 10 years ago. No derby, plus good stretching, massage, and yoga has helped my back issues to the point that I’ve been able to run again in the last three months, and I am so happy! I’m keeping it low-key at the moment, 30 mins a couple of times a week. It’s so good to be back into it though. So I typically do between 30-120 minutes of exercise six days a week, I eat (fairly) well, and in the past six months my weight-loss has slowed – I’ve now lost 14 kilograms since December 2014 (it was 10kgs in June). Here’s the funny thing. My weight-loss seems to have stopped at exactly the same point it did last time I lost weight 10 or so years ago. Like, exactly the same number. And I’ve been the same weight (give or take a few 100 grams here and there) for the past three months. It’s a bit frustrating, because having been 82 kilograms for so many years, I like the idea of being 70-something. But my body has other ideas! I know the numbers don’t really matter, but it’s something I’ve focussed on because it’s a measurable goal that I can reach for. But getting to a 70-something goal would mean cutting out (yet more) foods from my diet. I’m reluctant to do that. The answer is acceptance. Getting there. Grrr. I’ve spent the last 10 days recovering from the worst jet lag I’ve ever had. I am not sure why, but it’s taken me so long to start to feel normal again. Yesterday was the first day that I didn’t feel sick and tired all afternoon. Still, a bit of jet lag is soooo worth it for the amazing trip we had. Which is not bad considering how expensive most of Europe is and how bad the exchange rate was when we went. 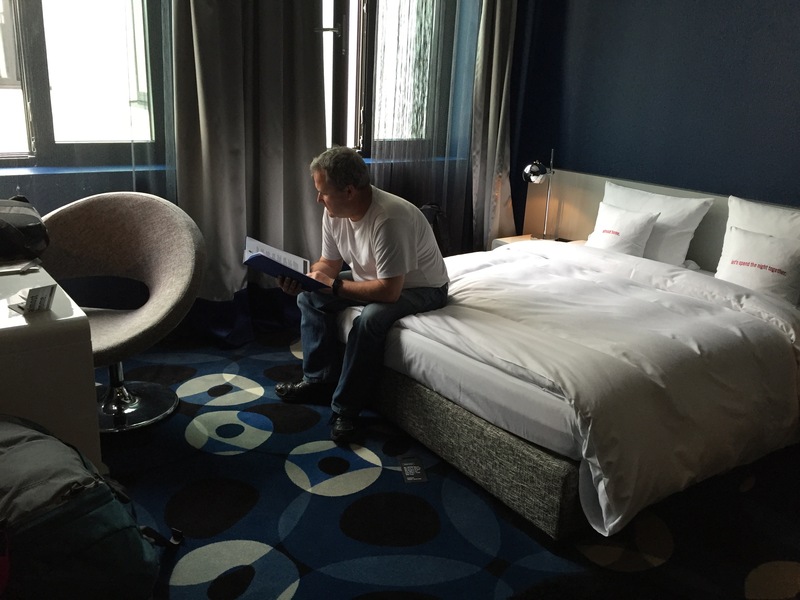 I’m not sure if it saved us much money or not, but we used Hotels.com exclusively for all our hotel bookings. We get every 10th night free with them, so I think it was a pretty good deal. It meant that we didn’t have to pre-plan anything – just look at what was available at the time we wanted and select the best for our budget. We got some great accommodation that way. And the backpack certainly helped in terms of not buying heaps of junk – I didn’t want to carry more weight than I needed to! Our train left at the very leisurely time of 12.30pm today, so we heaps of time for sleeping in and lounging around. We got to the train station and found out train easily, as usual. The more trains we’ve taken, the easier it become to figure out how it works – even when we are in a new country. It’s been completely smooth sailing sorting out the trains – high five us! The first class carriage was very comfy, with in-seat waiter service. Very nice! The trip from Berlin to Frankfurt was about 5 hours, so plenty of time to consume some more Heroes as I watched the countryside whizz by at approximately 230km/h. The trains in Germany are a bit faster than Italy, but slower than the French TGVs. I was sad to say goodbye to Berlin, I really enjoyed being there. I will definitely go back again. 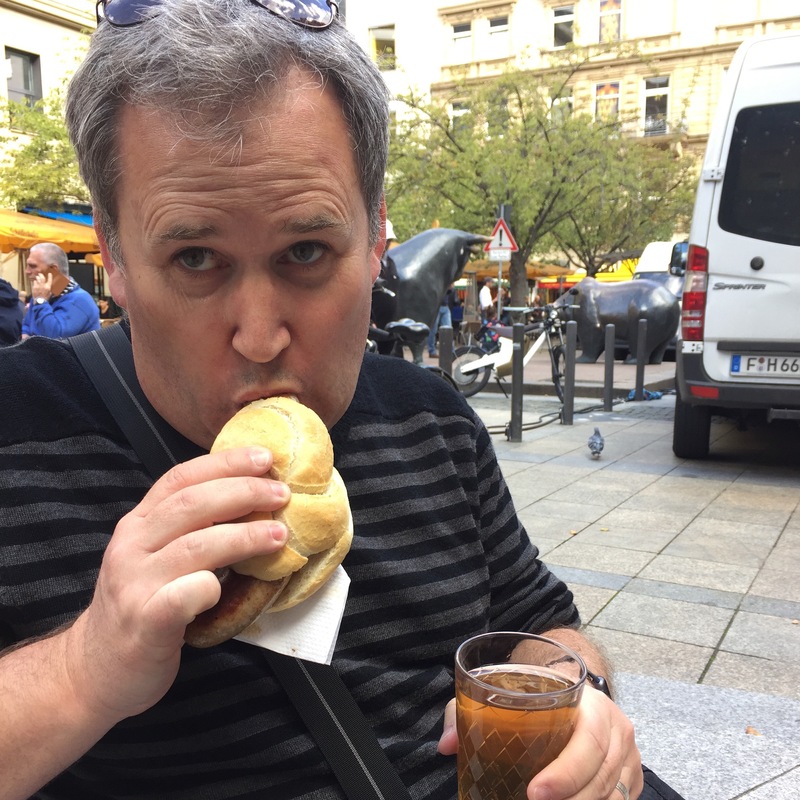 In fact, I think I’ve enjoyed Germany the best out of Europe. It has surprised me that I’ve found Germans the most helpful and friendly – more so than the French, Swiss or Italians. It probably helps that everyone speaks impeccable English in Germany. I was completely charmed by Berlin. It is such a strange place – so much history packed into one place, so much pain and suffering and grief and loss, and yet it’s still there, thriving away. We had a great time walking all over the place looking at buildings. There are so few old buildings, and lots of construction going on. So different to every other European city I’ve been to – this place was completely decimated by English bombing. Looking around, I thought that this is what Christchurch will look like in 60 years – a mish-mash of buildings of different styles, but very few that are more than half a century old, and most of the ones that are older are partly reconstructed. So fascinating. Anyway, on to Frankfurt. It has a reputation for being a modern, wealthy city- well-deserved. I love the mix of giant skyscrapers and old-style stone buildings here. They seem to sit together comfortably. It’s much smaller than Berlin, so very walkable. We dropped our bags at the hotel (which is just across from the train station) and walked into town for a look. It was nice just to wander and look. Of course we found an Apple Store first up, and then a Haagen Dazs. After some ice cream, we decided to save the best stuff for tomorrow, and headed home to bed once it got dark. Today was all about wandering and looking. We headed off for our local train station, only to find that the trains weren’t running (we think it was something to do with a death at a station down the line). So we used Apple’s new transit maps to catch two buses to Potsdamer Platz, where we had finished our wandering the previous day. We wandered along the remnants of the wall in the direction of Checkpoint Charlie. We stopped about half way at the site of a preserved section of wall that also contains a really detailed history of how Berlin was involved in WWII – with lots of stories about the people and places – both Jews and Nazis. The display is called the Topography of Terror. It started out as a temporary installation and is now permanent. The Topography of Terror and the Wall. 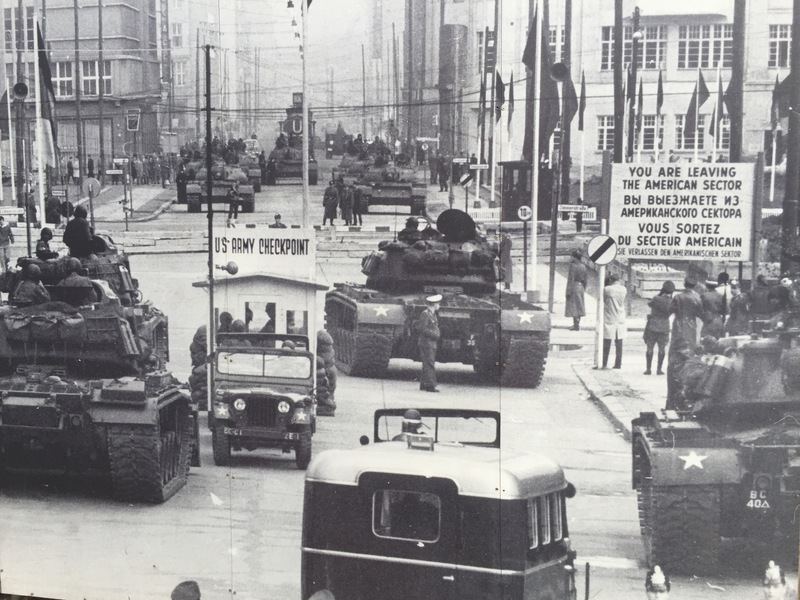 Checkpoint Charlie is one of three checkpoints installed in the American sector of West Berlin after the wall was put up in 1961 – i.e. Alpha, Bravo, Charlie – and has become something of a tourist attraction. The East / West divide is the weirdest thing, and something I didn’t fully understand before I got here. I had a vague idea that the Berlin Wall divided East and West Germany, but in fact, the wall contained the city of West Berlin within East Germany. The city was divided in two, and the West half was entirely contained within East Germany – you had to fly or catch a train to get from West Berlin to the rest of West Germany. 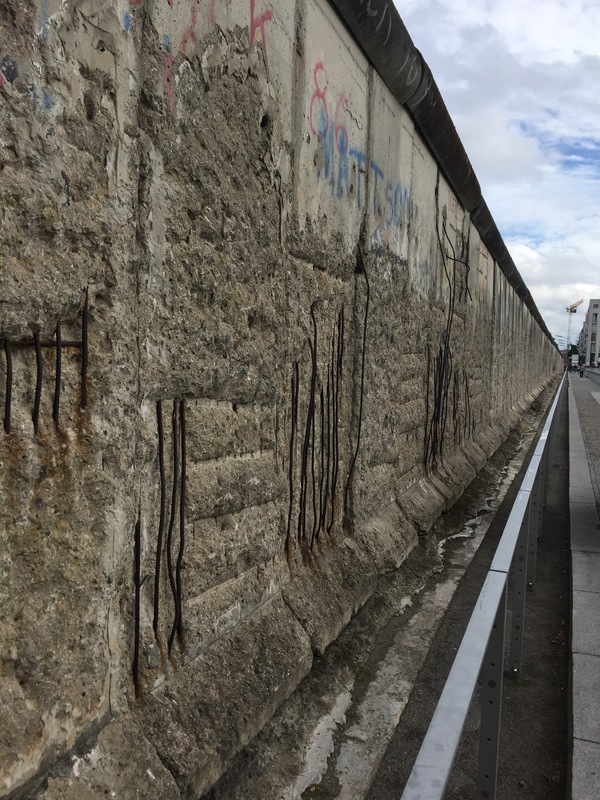 The wall was put up by the East years after the East/West split happened to prevent defections – over 3 million people left East Germany via West Berlin before the wall was erected overnight in 1961. It seems like a wacky idea to me to divide the city in half like that – if you lived in one half and worked in the other – too bad. If your parents lived on the other side, also too bad. What if you didn’t want to be a communist? 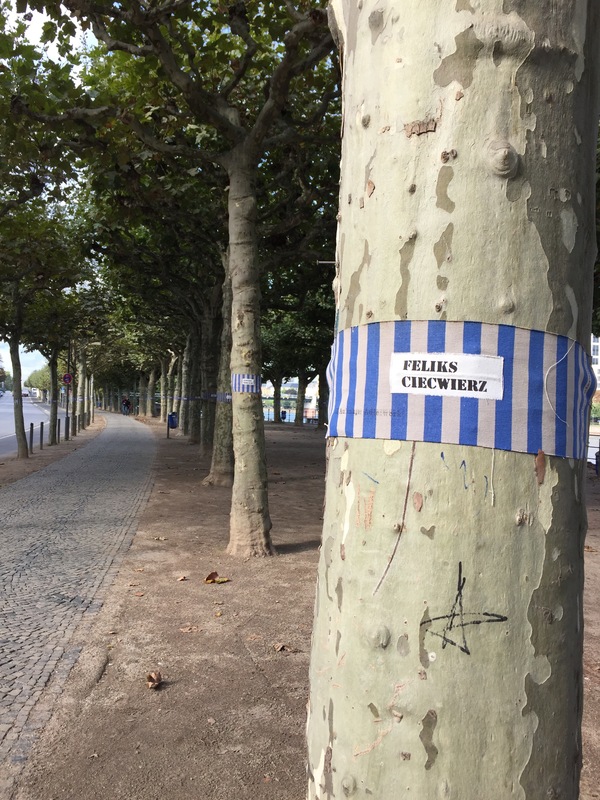 To bad – if you live on the communist side of Berlin, you’re a communist now. 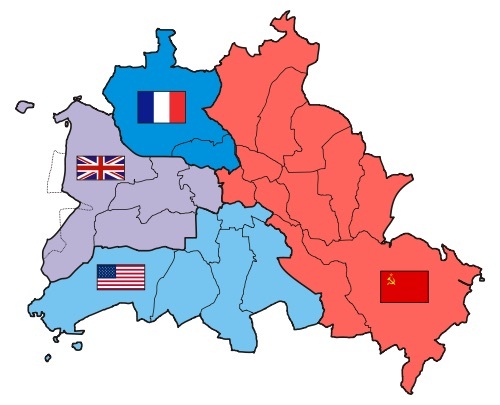 And then there is the fact that West Berlin (and West Germany) was actually three sectors – French, English and American. Immediately following the war, and after they’d agreed on the split with Russia, the Allies divided the West part of the city and country up and each nation ran their own bit of it. 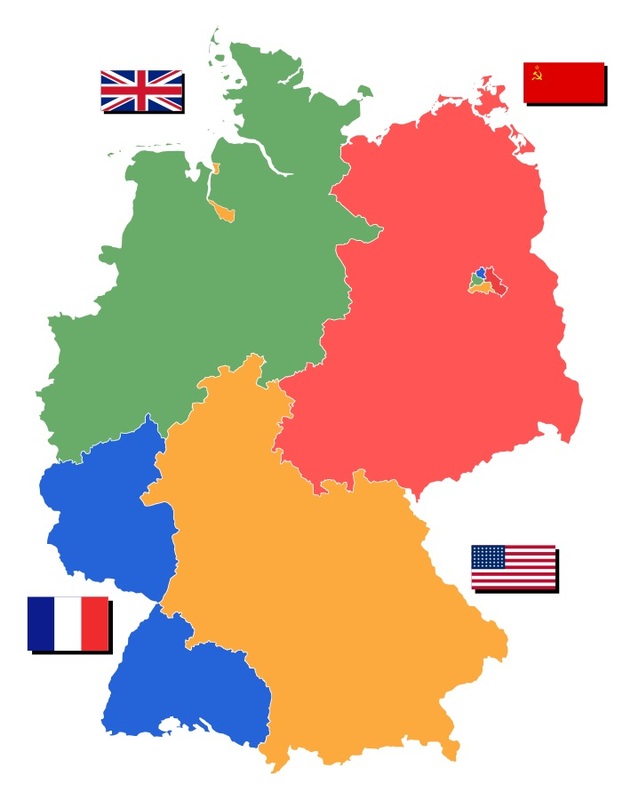 So when you think about it, ‘Germany’ after the war was actually a coalition country made up of France, Great Britain, USA and Russia. And this split happened because the Russians managed to make it to Berlin first as the war was ending. Politics is strange, to say the least. Anyway, back to the wandering. 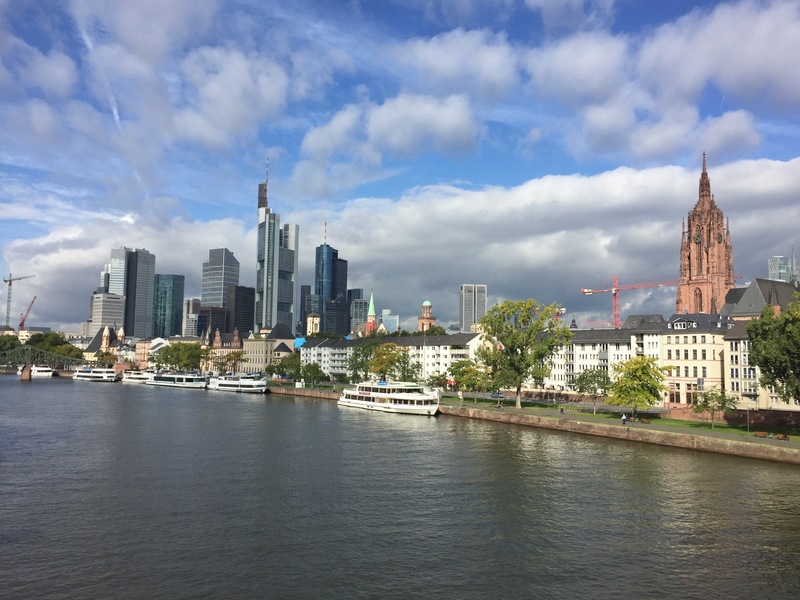 We meandered our way through the city, past the Berlin Cathedral, Museum Island and various other points of interest (we were using a very helpful and informative audio walking tour). We paused at the Berlin Museum to learn more about the rest of Germany’s history. The museum has an excellent display of history beginning around 200-300BC and going right through to reunification in 1990. Stephen was in shield and armour heaven. I liked the maps – Germany has changed its borders a lot in the past 1000 years! 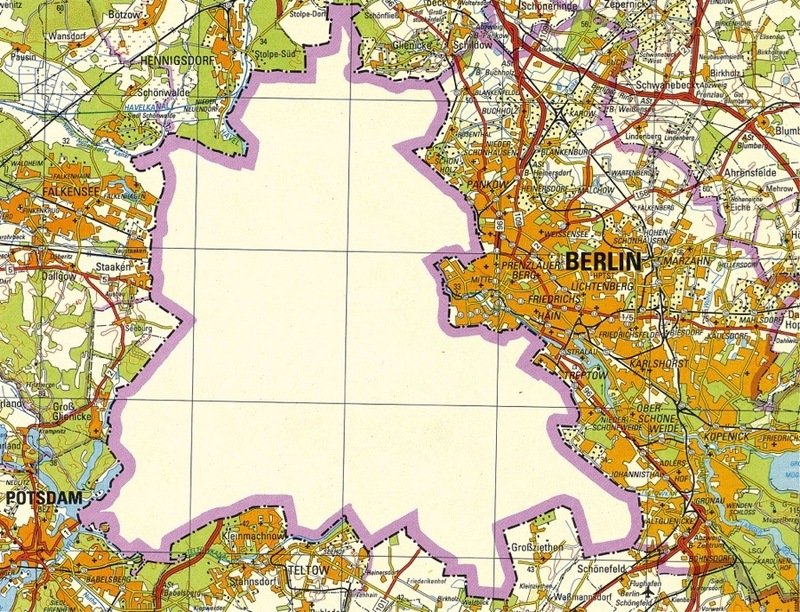 This map particularly amuses me – an East German map of Berlin. The bit in the middle is West Berlin. 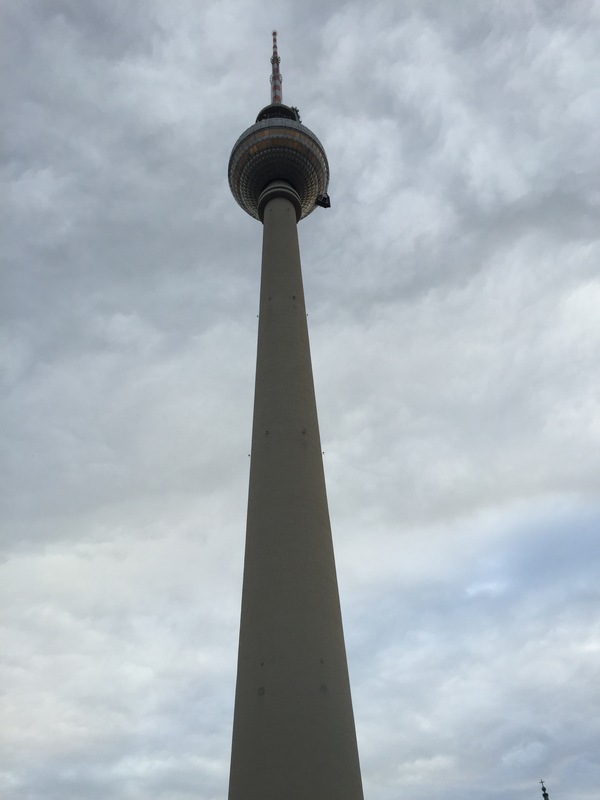 We stopped briefly for food then rounded out our walking tour at the Alexander Platz – a lovely square that was originally in East Germany, and contains the Fernsehturm TV tower. This is the second-tallest building in Europe (some other TV tower in Britain is taller). Second tallest in Europe. Build by the East Germans to show the West how awesome they are. 1000 steps from bottom to top – but there is an elevator you can catch up to the revolving restaurant in the bubble. Then on to more serious things – a visit to the Apple store – where there were people camping out waiting for the iPhone 6S – due to be released in two days. They were actual camping, with tents. We also found a Haagen Dazs across the road. Perfection. After a quick train ride we were back at base camp – a late night for us tonight, we didn’t get home until about 9pm. Frankfurt tomorrow! We were up and gone from our hotel at 4.30, and proceeded smoothly through check-in and security at Geneva airport – there was no passport control at either end (a bit strange!). We arrived in Berlin at about 8.30am and stopped at the airport for coffee and regrouping. We’ve learned the hard way that a new city, new country, new language can be discombobulating, and the best thing to do it take some time to get the lay of the land and figure things out. A strong coffee later, we had the trains and the language all sorted. It was built in the 1860s to celebrate the Prussian victory in the Danish-Prussian war. The monument was enlarged moved to its current location (at the end of a long avenue, the other end of which is the Brandenburg Gate) by Hitler in 1939 – the Nazis needed the space for some other grand buildings. You can climb to the top and get a great view of the city. What struck me was that the base was covered in scars from bullets….it obviously saw some action in the war. We started a city audio tour at this location, which took us past the Chancellory (not that interesting, built in 2002), the Riechstag (the current government offices, the Berlin Wall used to run right past the front of it), the Brandenburg Gate built in the late 18th century, badly damaged in WWII and restored in the early 21st century. All the while we were wandering back and forth between the old East and West Germany. There is so much history in this place! 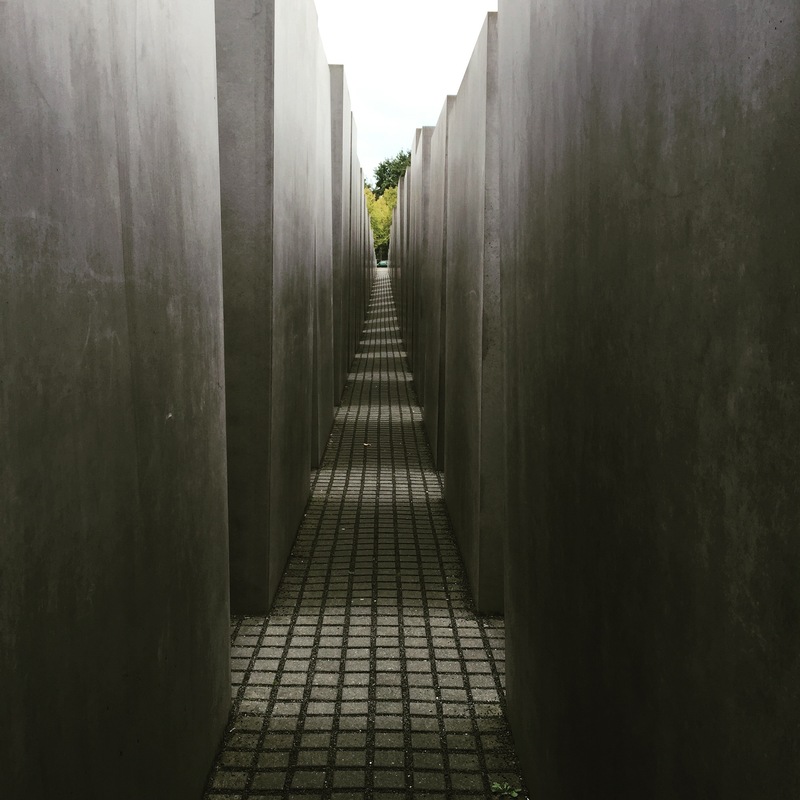 Our walking tour took us next to the Holocaust memorial – called the Memorial to the Murdered Jews of Europe – and information centre. The memorial is a group of 2711 large stones that kind of look like big gravestones, but they are all different heights. I think it’s supposed to express the simultaneous order and chaos of the time. The information centre was extremely emotional and powerful. It focussed on the people – lots of photos and as much as possible, details of who was in them, what was happening, and the stories of the people behind the numbers. And the numbers are just staggering. I think I’ve become used to the idea of 6 million Jews dying in the war, but the centre really personalised this for me. I noted to, that the language used was very direct – the words murder and genocide were used, making the point again and again that the Jewish people didn’t just die, they were murdered. 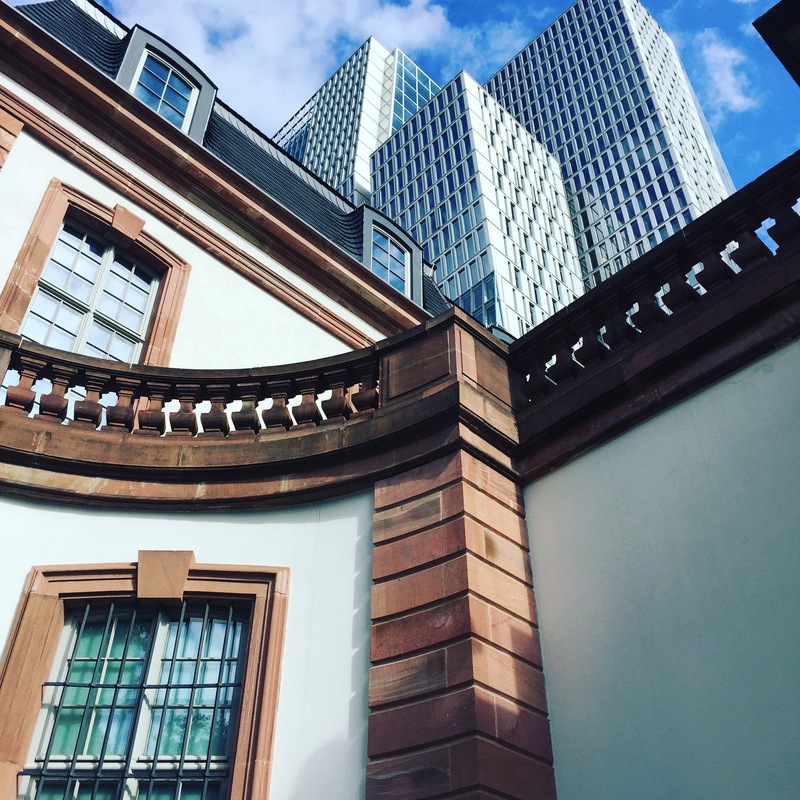 We emerged from the centre reeling a bit, and so wandered along to the Potsdamer Platz – important for the part it played during and after the cold war. The original square (platz) was the old heart of the city, and the central train station. It was destroyed in WWII (along with most of the rest of Berlin), and then had the Berlin Wall running right through the middle of it, so all the buildings in the Platz are now shiny new. In 1989, this was one of the first places that the Berlin Wall was breached, and was the location of a concert that was held here celebrating its removal (I remember this concert!). It was so cool to see such a long history in one place, but a history that included important events that I remember! We stopped in at the Haagen Dazs store for a treat before jumping on a train back to the hotel about 6pm. It had been a long day and we were done for now! We will pick up again in the morning at Potsdamer Platz and continue our tour of the city.